Road and Track Magazine takes a gaggle of 2013 performance cars and puts them head to head to see which one takes the first Performance Car of the Year award. They pick five, no six cars out of the group and take them out in the real world to see which one takes the title. Head over to check out the full test. 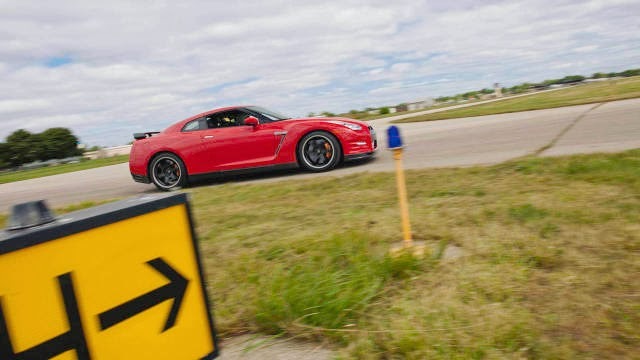 There's a lot of chuckling in the paddock over the blue seats and odd Track Edition badging on Nissan's newest GT-R, but on the runway, it's serious business. It's also damn near the fastest car in the test. "It's so good ... and it used to be so terrible," says Cammisa. The low-speed understeer and clumsiness found in early versions of this car are gone, replaced by an all-singing, all-dancing sense of competence. But the Nissan's logbook is almost empty. It's quick, but it's not making an impression on most of us.